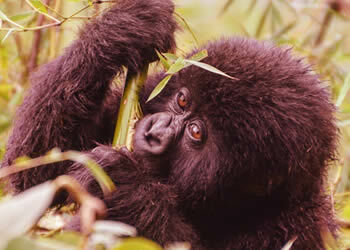 showcases the natural beauty and wildlife of volcanoes national park, Rwanda’s top tourist destination. The park is home to mountain gorillas; golden monkeys a variety of tropical birds and includes 3 virunga volcanic mountains namely mount. Karisimbi, Mount. Bisoke and Mount. Muhabura. 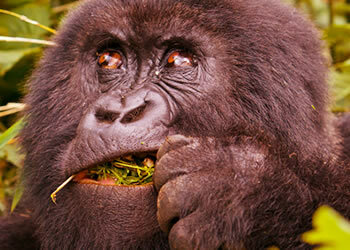 This trip will satisfy your primate and nature desires. 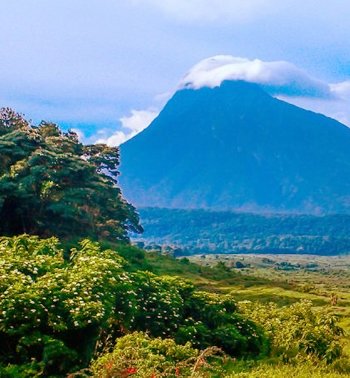 You will track gorillas and hike karisimbi and spend overnight on the summit of this tallest volcano in virunga. Early Morning at 07:15am after breakfast, prepare your hiking gears like packed lunch, rain jacket. Head to kinigi visitor center gather with other tourists going for gorilla trekking for briefing. Thereafter, guides will lead to the forest looking for gorillas. After they are found, you are allowed to take photos and observe how the feed for 1 hour. Return back for lunch at the lodge. Later in the afternoon, visit Iby’iwacu cultural village. The indigenous Rwandan people who live in this small village are dedicated to agriculture but decided to start up their arts and culture program to improve their livelihoods and also helps in gorilla conservation. Local families including BaTwa will share with you their traditional ways of living, beliefs, food harvesting and preparation. Return for dinner and overnight. Hiking starts early morning with briefing and preparation of your backpacks, camping gears, drinking water among others. You may hire a porter to help you carry your bags, however it is not mandatory. Your team includes other hikers, 2 guides and armed ranger and porters. Hiking is done at a slow pace and will take 6-8 hours to reach the camping site at the summit where you will enjoy views of virunga volcanoes and overnight camping.